AJS are an established engineering and fabrication company specializing in the manufacture of High Chromium Carbide Wearplate and its fabrication. Loader Bucket, Truck Bodies Hoppers and Feeders. It can be supplied in sheet form or fabricated to a customers requirements. All sizes, shapes and thickness can be supplied. Specialized Plate can also be manufactured for special application. By its nature Chromium has a low coefficient of friction, is hard wearing and is resitant to a wide variety of corrosive agents and materials. 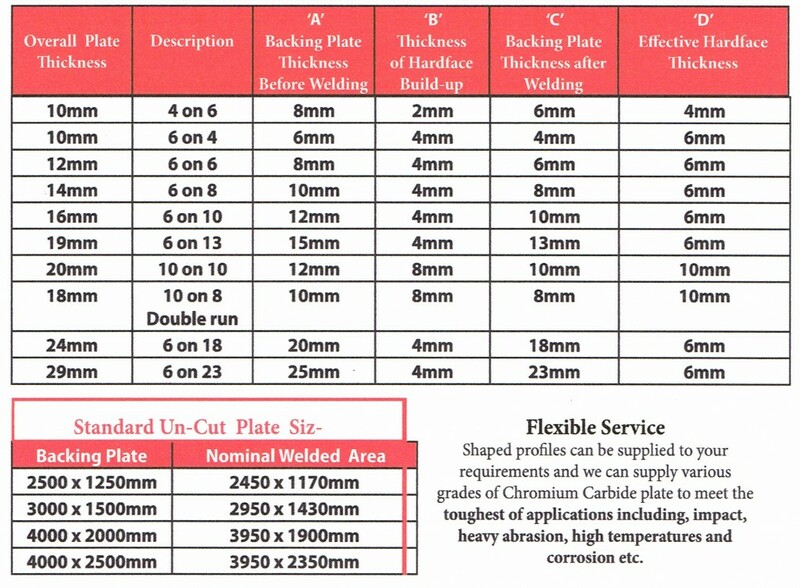 These attributes make High Chrome Carbide Plate particularly attractive to applications plagued by accelerated wear, high friction, and corrosive chemical attack. AJS 600-2 Standard Wearplate consists of a very hard abrasion and impact resisting High Chromium Carbide facing fused to a Mild Steel Backing Plate. The metallurgical bond is formed by a homogenous interface layer from the dilution of the two materials. The excellent hardness is achieved by deposition of this specially developed Chromium Carbide facing rather then by heat treatment so that the wear resistance is more consistent throughout the structure. This Wearplate can be supplied in standard sheets nominally 3000mm x 1500mm in varying thickness plus a standard layer of 6mm or thicker cladding. The Hardfacing is 6mm with a standard minimum of 4mm of the pure Chromium Carbide Deposits. It can also be supplied in a double layer with a standard minimum of 10mm of pure Chromium Carbide Deposits. All sizes, thickness’ and rolled sheets with different chemical compositions for use in different applications can all be supplied to order.